Nissan is today releasing prices and specifications for its new GT-R supercar. UK deliveries begin in March 2009, but selected dealers – Nissan High Performance Centres – will be accepting pre-orders accompanied by a £3500 deposit from 2 April this year. 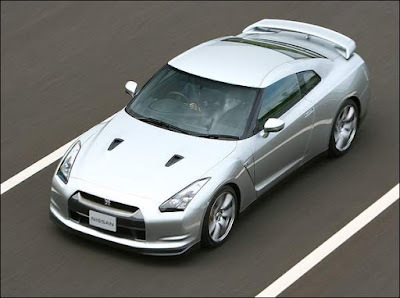 From 4 April, customers will also be able to pre-order GT-Rs by placing a deposit on-line at www.gtrnissan.com. Nissan GT-R Black Edition with exclusive Kuro black paint, gunmetal grey alloy wheels and black leather and Pearlsuede interior with red leather highlights £55,500. For those passionate car enthusiasts who will be signing up for GT-R ownership, there will be a series of tailored customer events and experiences giving them the opportunity to see the car up-close, get to know it and, ultimately, experience its performance before they take delivery. More details of these special, Nissan-supported GT-R customer events will be released in the coming weeks and months. Furthermore, 10 specialist dealers – Nissan High Performance Centres – have been appointed in the UK to ensure that GT-R customers receive the level of specialist attention and aftersales care that this special car warrants. They will invest in the specialist sales and technical training for their staff that such a car demands, as well as the highly sophisticated equipment necessary to maintain and repair the GT-R. The Nissan High Performance Centres have been chosen because they share the passion that customers have for the GT-R, and they have met strict criteria in terms of customer satisfaction, resources and location relative to customers. For the full 3 year duration of their warranty, GT-R customers will also enjoy the convenience of a free collection and delivery service for the routine maintenance of their car. At the customer’s request their car will be collected from anywhere in the UK and transported to one of the 10 Nissan High Performance Centres. Already widely acknowledged as one of the best handling and most powerful supercars ever, the new Nissan GT-R is designed to be driven fast and skilfully by just about anybody, over a variety of road conditions and in total confidence. It is also about everyday practicality, offering four seats and reasonable luggage space. Yet this winning combination is available from just £52,900. At this price there is nothing to match it in terms of performance and dynamic ability. In stark performance terms, 62 mph from a standing start appears in around 3.5 seconds, while its potential top speed is 195 mph (provisional figure). But it is the GT-R’s astonishing ground covering capabilities that mark out the new Nissan, ably demonstrated by a 7m 38s lap of the demanding Nordschleife (Nürburgring), one of the fastest times ever recorded by a production car and achieved in less than favourable conditions. Behind those statistics lies a unique driveline comprising a 480 PS twin turbo 3.8-litre V6 engine, a world-first rear transaxle with a dual-clutch, paddle shift six-speed transmission and full time four-wheel drive. Underpinning them are sophisticated electronic controls designed to make best use of engine output in all conditions without diluting either driver enjoyment or involvement. Adaptability is central to the everyday nature of the GTR and set-up switches in the centre panel allow gear shift characteristics, damper settings and stability control settings to be adjusted to suit the driver’s mood and driving conditions. All models come extensively equipped, with eight-way adjustable front seats trimmed in leather and perforated Pearlsuede, dual zone automatic climate control and cruise control reflecting the GT-R’s softer side. The standard AM/FM/CD audio system comes with six speakers, RDS and MP3/WMA CD playback capability, and features an HDD Music Box system capable of storing 9.4 GB of your favourite sounds. A unique multi-function LCD screen developed with the designers of Sony PlayStation’s Gran Turismo game provides an instant indication of a range of vehicle dynamics such as lateral g-forces which, if you prefer, can be stored for later analysis. There are also six airbags, special wide-beam xenon headlamps, a tyre pressure monitoring system, Intelligent Key, 20-inch lightweight alloys in bright silver and a Thatcham-approved anti-theft system. Move up from the standard car at £52,900 to the GT-R Premium Edition at £54,200 and you get automatic headlamps and a specially designed digital Bose® audio system. The 11 speakers – all mounted in rigid aluminium die cast panels – include two sub-woofers between the rear centre armrests. And completing the GT-R line-up is the £55,500 GT-R Black Edition with, yes, you’ve guessed, an exclusive Kuro black paint job, gunmetal grey alloys and a striking black leather and Pearlsuede interior with red leather highlights. Available for delivery from September 2009 onwards will be an optional HDD-based satellite navigation system with a 30GB hard drive, touch screen, voice recognition and full Bluetooth hands free phone integration, all for £1900. UK order books for the GT-R open 2 April and first customer deliveries are anticipated in March 2009. Availability is limited by the specialist build process, with engines and transmissions individually assembled by 14 craftsmen in a special clean room area in Nissan’s Yokohama plant. Global output is therefore currently restricted to around 1000 units per month. Given its specialist nature, the GT-R will be offered worldwide exclusively through carefully-selected Nissan High Performance Centres, all of which will have invested in sophisticated equipment and trained technicians with the expertise to work on the GT-R. Ten of these centres have now been appointed around the UK. The GT-R’s development team set out to create a supercar with high levels of safety and performance designed ‘for anyone, anywhere, at any time’ – in other words, a car that provides total confidence in all weathers that is as secure and relaxing to drive quickly, as it is at more sedate speeds. One indicator of its usability is the fact that it is possible to have a conversation without raising voice levels even at 186 mph (300 km/h). To achieve their goals the team adopted a clean sheet approach, with every component developed exclusively for the GT-R. Weight distribution and aerodynamic efficiency have influenced every stage of the design process. The brand new VR series 3.8-litre V6 engine is equipped with twin IHI turbochargers. It is a particularly tractable unit with peak torque of 588 Nm delivered between 3200 and 5200 rpm. However, even when driving on moderate throttle openings the GT-R typically generates about 390 Nm of torque, ensuring excellent pick-up and acceleration. Among its advanced engineering features is an innovative plasma coating just 0.15 mm thick sprayed on to the cylinder bores in place of conventional liners. This is better at dissipating heat, so boosting both power and economy, and saving about 3kg in the process. Breathtaking performance is naturally complemented by immense stopping power and the Brembo brakes can take the GT-R from 62 mph to standstill in a distance of just 36.9 metres. The cross-drilled, two piece, floating 15 inch (380 mm) discs both front and rear feature diamond-shaped ventilation ribs and highly rigid, 6 pot (front) and four pot (rear) monoblock callipers with racecar-inspired three-point mountings. At the heart of the GT-R is one of the most advanced four-wheel drive systems ever developed in a production car, offering unmatched traction and handling security. In a world-first, it features a rear mounted independent transaxle which packages the transmission, transfer case and rear differential in one compact assembly independently mounted on rubber bushes. Moving the transmission to the rear in this way gives the GT-R a superb weight balance, while enhancing front seat leg room. The design uses special twin driveshafts, one of which takes the drive from the engine back to the transaxle, the other transferring drive forwards from the transaxle to the front wheels. The four-wheel drive system continually adjusts torque between front and rear based on dynamic demands and road conditions; in normal conditions 100 per cent of torque is directed to the rear axle, with up to 50 per cent of torque fed to the front wheels to improve traction when necessary. The GT-R’s GR6 dual-clutch transmission allows the driver to manually shift gears via paddles located behind the steering wheel or to opt instead for automatic changes as the mood dictates. Either way, since there is one wet clutch for odd gears and one wet clutch for even gears, the next gear is already preselected which allows for exceptionally fast shifting. There’s also an automatic throttle blip on downshifts to precisely synchronise engine speed and give added satisfaction to the driving experience. Set to manual mode (M), the paddle shift gives exceedingly quick changes, thus maintaining turbo boost, for seamless and powerful acceleration. In R mode, predictive pre-shift control preselects the next gear change based on throttle position, vehicle speed, braking input and other information. And in automatic mode (A), changes are made to maximise fuel efficiency. Hill Start Assist is also provided, momentarily holding the brakes as you move your foot to the accelerator pedal when starting off to prevent roll back. The double wishbone front and multilink rear suspension features Bilstein DampTronic dampers which can be adjusted by the driver to either Comfort, Sports (the normal setting) or R (high performance) settings. R mode delivers flat, hard cornering for high-speed and maximum feedback. Sensors measure 11 parameters including speed, lateral acceleration, steering angle, and engine torque, the data is then analysed to provide appropriate damping forces for all situations. Lightweight 20-inch forged alloy wheels are shod with specially developed 255/40 ZR (front) and 285/35 ZR (rear) Bridgestone run flat tyres designed to balance high grip and all-weather capabilities and a comfortable ride in all driving conditions. The GT-R makes extensive use of lightweight materials including aluminium for the bonnet, boot and outer door panels, diecast aluminium for the front suspension strut housings and door structures and high strength carbon composite for the front cross-member. Muscular and wide shouldered, the GT-R has an undoubtedly strong presence. At first glance the styling is square and edgy, but look closer and it is full of interesting curvatures and subtle shapes. Distinctive elements include the kink in the rear pillar which helps rear airflow, the ‘cantilevered’ roof, and the aggressive front end, with a large bonnet bulge and single air intake. It’s also a practical design and the flat sided deep flanks make it easy to judge the car’s width, it is easy to get in and out, and visibility is good. Japanese car culture and video games have been key influences, while the design also acknowledges Nissan’s proud GT-R heritage including the edgy boxy shape of the PGC10 GT-R of 1969, the four round tail-lamps of the KPGC110 GT-R of 1973 – also mirrored in the four chunky chrome tipped 120mm exhausts – and the long thin slit grille opening of the R34 GT-R of 1999. Ultimately, however, the styling is dictated by aerodynamic efficiency and the desire to make the GT-R as ‘slippery’ as possible. Intensive wind tunnel work has resulted in one of the best drag coefficients in the sector – just 0.27 – which is all the more impressive on a supercar that generates high downforce front and rear. The car’s newly developed six-stage paint system is painstakingly hand polished to achieve a perfect paint finish. The application of a double clear coat gives it a lustrous sheen, while it is also extremely resistant to chipping and scratches thanks to the application of a special anti-chipping coat in critical areas. GT-R’s interior styling undoubtedly evokes the car’s performance capabilities, but it is also highly practical, with readily intuitive, easy to use controls. The driver grips a small diameter, multi-function steering wheel trimmed in a soft, hand-stitched leather also used on the gear shift lever and on the dashboard, centre console and door trims. A red start button on the centre console is activated by the Intelligent Key system. The main instruments are circular analogue dials which are ‘meshed’ to resemble engaged gears: a large tachometer, red-lined at 7000rpm is in the centre, with a smaller gear indicator, water temperature and fuel gauges to its right and the speedometer on its left. They’re complemented by the multi-functional 7 inch LCD instrument display in the upper centre console. This enables the driver to view a wide range of vehicle telemetry not dissimilar to that appearing on TV screens during Formula 1 coverage, and the graphics have been developed in conjunction with Polyphony Digital Inc., designers of the Gran Turismo game for Sony PlayStation. The customisable displays include lateral and transverse g-forces, accelerator opening and steering angle and a wide range of mechanical data including oil temperature and pressure and turbo boost. There’s also an ‘optimal gearshift map’ to encourage economical driving. For the more serious-minded driver, the system means you can also keep a detailed log of driving characteristics. The multi-functional screen also doubles up as the display for the optional satellite navigation, as well as the audio controls. The front sports seats are heavily bolstered for maximum support and comfort. Eight-way adjustable, they offer the greatest range of seat adjustment of any supercar, while the steering wheel is adjustable for reach and tilt. The two rear seats, easily accessed using the entry/exit switch on the front seats, are better suited to children or for carrying bags, and jackets, although they are perfectly comfortable for most adults on short journeys. The boot provides a 315 litre (VDA) capacity, emphasising the GT-R’s everyday usability. GT-Rs are assembled in the Tochigi factory where Infiniti models are also built. The high technology and premium nature of the vehicle are reflected in higher precision tolerance control for all body parts, vibration testing of all bodies and the use of specially designed precision machine tools to ensure the highest quality standards for what is a complex and sophisticated vehicle. Customers can either order their car online at www.gtrnissan.com and pay a £3500 deposit within 30 days to one of the 10 newly appointed Nissan High Performance Centres or they may go direct to a Centre to place their order. Once orders have been confirmed, customers are provided with a password-protected area on the website called ‘Your GT-R’ where they will be kept informed of the progress of their car and the anticipated delivery schedule. There will also be a dedicated Concierge call number which will deal with any queries they might have. Nissan will launch a specialist Concierge Service for GT-R customers. As well as keeping customers fully up to date with all things GT-R and the status of their order, the Concierge Service will also coordinate the exclusive customer GT-R events. Upon delivery of their GT-R, owners can continue to subscribe to the programme for only £150 (approximately) per year. A wide array of customer services will be offered including access to route guidance, travel information and hotel and flight bookings. All specification details relate to the Japanese domestic version of the Nissan GT-R and may not be consistent with final European figures. Final European GT-R technical specifications will be confirmed closer to start of sales. Your blog is amazing! thanks for posting that much! Please post any infos you get regarding release in Switzerland! Navigation available from September 2009 onwards? Is that a joke? It's already now available in the US and Japan and they even get it for free. So we are supposed to pay for it and then have to wait for it till the summer of 09 is over? This just can't be it.